Baby Taj is not just known as the precursor of India’s crown jewel, Taj Mahal. 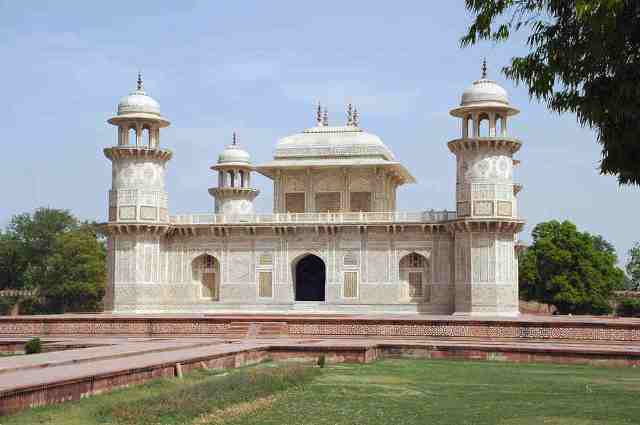 Also called Itmad-ud-Daula’s tomb, it is the first Mughal monument entirely built from marble. Furthermore, this structure is also the first to extensively use Pietra Dura, a decorative art technique that uses intricately cut and polished stones to make images. Most importantly, this beautiful mausoleum is perhaps the most exquisitely adorned in Agra, and possibly in entire India. This is the tomb of Mirza Ghiyas Beg and his wife, Asmat Begum. Mirza came to India from Persia and joined the court of Emperor Akbar. Akbar bestowed him the title Itmad-ud-Daula, which means ‘pillar of the State’. Mirza’s daughter, Nur Jahan, married Jahangir in 1611 while his son Asaf Khan became the general to Jahangir. Asaf Khan’s daughter Mumtaz Mahal married Shah Jahan, also known as Prince Khurram. Mirza died in 1622 and from that time, Nur Jahan started the construction of the tomb which was finished after six years. While the Taj Mahal will mesmerize you with its grand beauty and splendid presence, the Baby Taj is more elaborate, with intensely complicated latticework and paintings. From afar, you can immediately notice its Islamic style of architecture, with its pure white and intricately carved mausoleum of Itmad-ud-Daula. The minarets, arched entrances, use of carved floral patterns, inlay and marble-screen works all represent the Islamic architectural style. The tomb is made of white marble, the first of its kind during the Mughal era, when all buildings were built from red sandstone. With that said, this tomb is the precursor to the white marble palaces inside the Agra Fort, as well as the incomparable Taj Mahal. The mausoleum lies at the eastern bank of the Yamuna River. It is specifically placed in the center of a Char Bagh or a four-quartered Mughal garden, a square garden separated into four quadrants by concrete paths with water channels that run through the center. Just at the end of every path is a red sandstone gate structure. These gates vary only in design which consists of floral and geometric patterns using white marble, with all four gates having the same size. The Baby Taj has a square floor plan with octagonal towers on each corner. Inside is a square hall that houses the cenotaphs of Mirza and his wife, while the other room houses the tombstones of Ladli Begum, Nur Jahan’s daughter, and other relatives. Both the interior and exterior are adorned with inlay work, usually floral and geometrical designs, which is a striking scene to behold. The entire floor, walls, and ceiling are full of decorations using a combination of stucco, tiles, and inlaid marble. Similar to Taj Mahal, you need to leave your shoes at the entrance of Baby Taj or wear shoe mittens over your shoes. Tourists often have a blissful experience inside while observing the walls, the floor, and the elaborate decorations of the ceiling. You may bring a penlight or a flashlight with you since the interior can be dark even during daytime and you will need light to appreciate the stunning carvings and decorations.